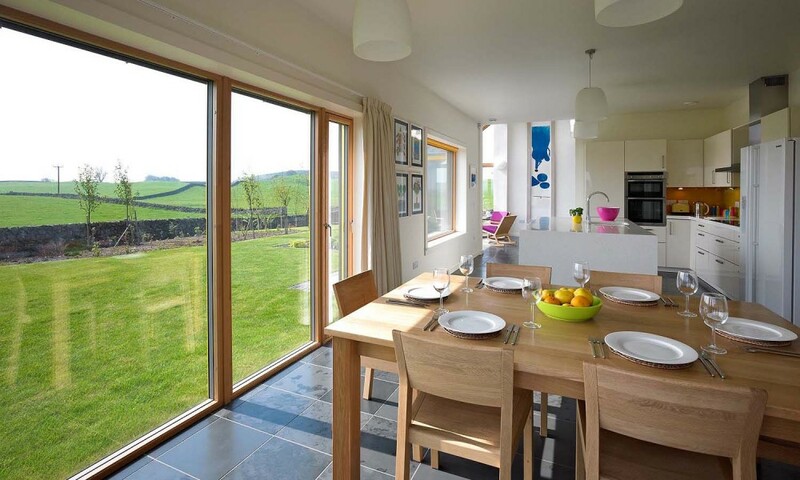 Fordhouse is located in rolling open countryside near Castle Douglas in south west Scotland. It replaces an existing derelict farmhouse and is sited to enjoy the spectacular panoramic views to the south, east and west. The house is divided into three linked forms expressing the main two storey house with garage wing and studio / guest wing enclosing an entrance forecourt. These three elements are stretched across the site to create a sunny private garden and more formal entrance to the north. 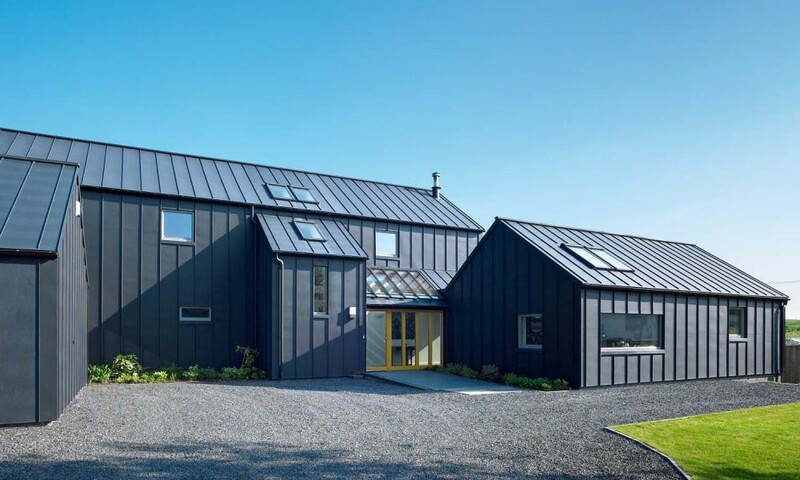 The form of the house with 40° double pitched roof echoes the traditional local houses but the black zinc roof and wall cladding gives it a contemporary twist, and an agricultural barn-like appearance from a distance. The clients are two artists who approached us specifically requesting a black clad house with the use of acid colours for some of the windows. 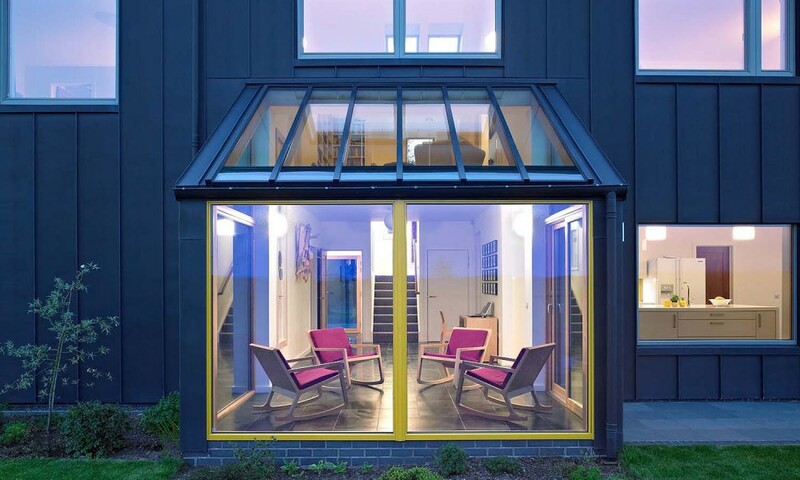 We encouraged them to go for the black zinc cladding for durability and a more sophisticated appearance. 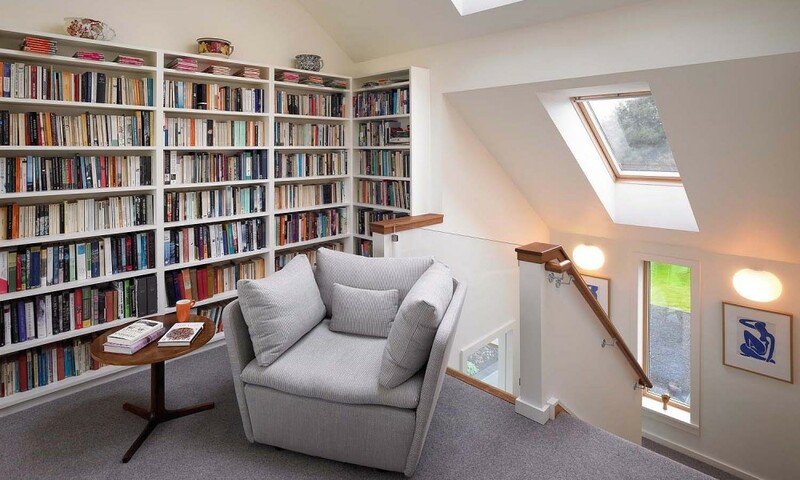 They also required specific handing space for their art collection — more particularly a large Victor Passmore print requiring siting in a two storey void. The design is also driven by a strong energy efficient agenda. 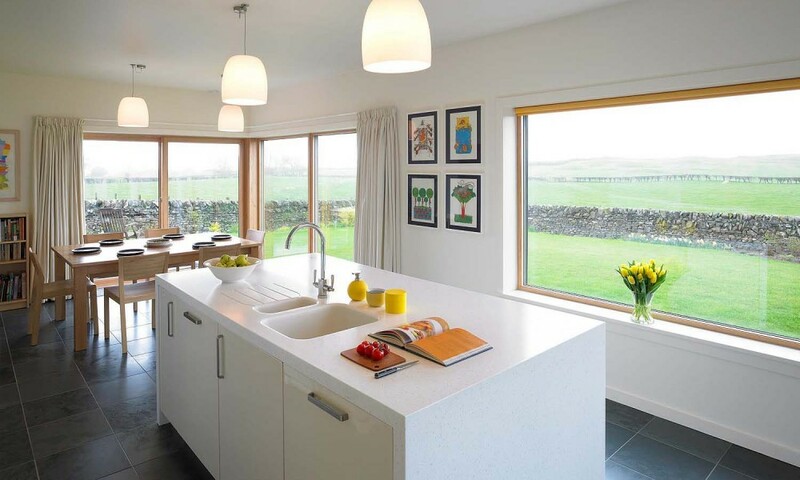 The house is constructed to Passiv Haus standards of insulation and is heated by a geothermal heat pump, solar hot water panels, and a whole house heat recovery ventilation system giving the highest energy performance rating. 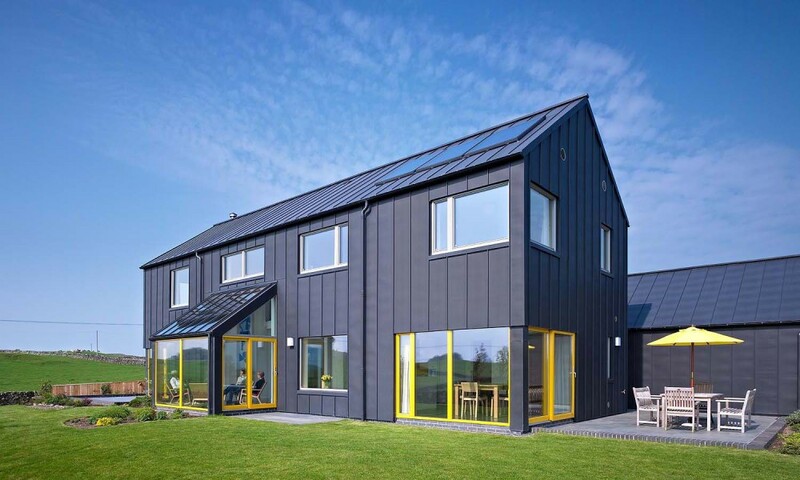 The house is constructed as a 195mm timber frame clad entirely in black VM zinc. 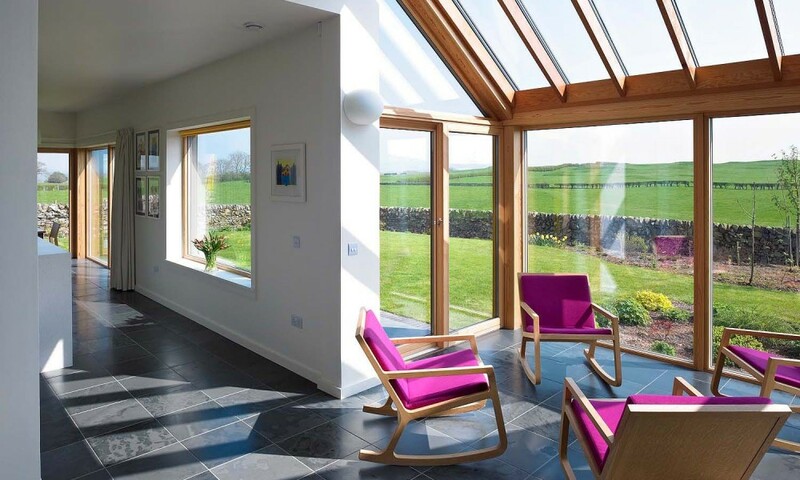 Windows are thermally broken aluminium clad triple glazed, giving a U value of 0.7. They are detailed to exactly match the module of the zinc standing seams giving the appearance of being hewn out of solid metal. Construction work took about 10 months with completion at the end of July 2009. The main contractor chose to train himself to undertake the zinc cladding and has achieved an astonishingly high quality finish with very difficult detailing. The contract was within budget with a relatively low cost per square metre for a house of this standard.